I typically don’t do a lot of cookie baking around the holidays since we already seem to be swamped with sweets from every corner at this time of year. 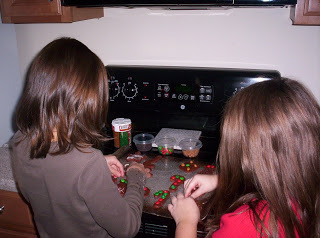 However, once our daughters were old enough to bake with me, I wanted to begin a tradition of making some type of shaped cookie that they could decorate as they pleased. Since I personally don’t care for gingerbread, I was delighted some years ago to find a recipe for chocolate cookie dough that I could use. 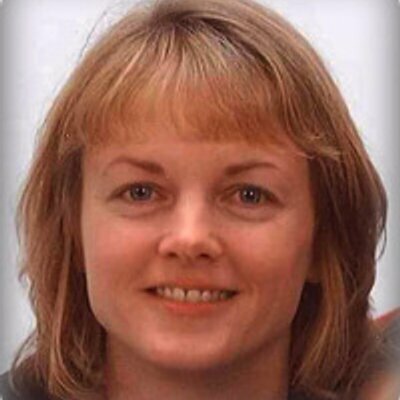 It’s from the Holiday 2004 edition of Kraft Food & Family magazine and I’m posting it here, in order to share it with you – and also for posterity’s sake, in case I ever lose the original! Preheat oven to 350 degrees. Beat butter, sugar, dry pudding mix and egg in large bowl with electric mixer on medium speed until well blended. Roll out dough on lightly floured surface to 1/4 inch thickness. Cut out the dough into shapes using large cookie cutters; place on lightly greased baking sheet. 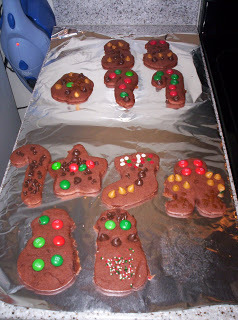 Reroll scraps and cut additional cookies as needed. Decorate cut-outs with assorted decorations, pressing in lightly. Bake 10 to 12 minutes or until slightly firm. 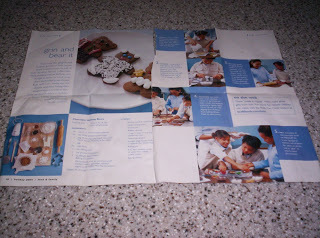 Remove from baking sheets. Cool on wire racks. Melt chocolate in microwavable bowl on medium power until melted. 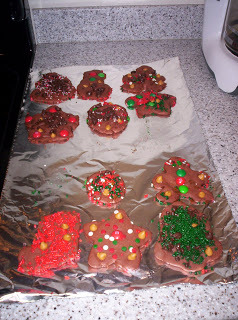 Spread on cookies as desired or use as “glue” to attach more decorations. Every year, my daughters and I bake these together a few days before Christmas, keeping some for ourselves and sharing some with friends. This time we decided to carry out this tradition by including a couple of friends in the baking. To help things go more smoothly, I made the dough ahead, then had each set of girls roll out their own dough, use the cookie cutters to create the shapes they desired, then decorate their individual cookies. The older girls ended up with neatly decorated cookies…..
…..while the younger ones were a bit more random and generous with their toppings! This is another tradition that I look forward to every year and is an additional way to create fun memories together! Others are sharing their Christmas food traditions at Life as Mom. You can't go wrong with chocolate cookie dough! After I get Madison back from her dad's tomorrow, I plan on riding through a few neighborhoods to look at Christmas lights and then come home to bake cupcakes with her. We will save one so we can put a single candle on it and sing "Happy Birthday" to Jesus on Christmas morning before she tears into her gifts. Aww. I just wrote about making cookies with my girls too. Such sweet memories are made in the kitchen.. especially this time of year! 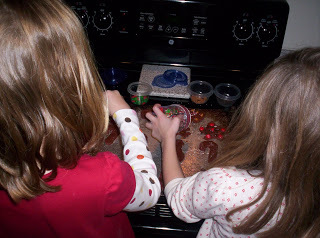 I have grand-daughters and love baking with them. We make sugar cookies and decorate them. THANKS!!! for sharing. Hey, they look really good! Thanks so much for sharing the recipe! This cookie would be perfect to add variety to the tins I'm making for gifts!